County partners with nonprofit to implement plan to reuse, recycle or convert waste. The Kent County Department of Public Works (DPW), Grand Rapids, Michigan, and The Right Place Inc., a regional nonprofit economic development organization, have entered into a three-year strategic partnership for the planning and development of a sustainable business park. Under the terms of the agreement, The Right Place will assist with business development and infrastructure planning efforts, as well as managing community partnerships and identifying new sources of funding for the sustainable business park. Kent County Board of Public Works approved the plan October for 250 acres adjacent to the South Kent Landfill in Byron Center. The plan was created by local and national experts and includes recommendations on how Kent County can transition from a reliance on waste disposal to landfills to a sustainable materials management system where waste materials are either reused in new production processes or products, recovered or converted into renewable energy. Kent County DPW processes more than one billion pounds of waste per year and estimates 75 percent of waste could be reused, recycled or converted. Currently, only 6 to 8 percent of waste is recycled. The sustainable business park could generate $500 million in direct private sector capital investment and create 150 jobs in Michigan. As part of the plan approval, DPW formed a business development team to implement the plan, which includes The Right Place. The county has a goal to reduce municipal, commercial and industrial solid waste going to landfills by 90 percent by 2030. “The sustainable business park has the potential to generate investment and create jobs in West Michigan, while serving as a national model of what communities can achieve with a practical, innovative approach towards recycling and upcycling,” The Right Place President and CEO Birgit Klohs says. Cleanup crews are picking up the pieces of the deadliest wildfire in California history to help restore the town of Paradise. Right before sunrise on the morning of Nov. 8, Pacific Gas & Electric (PG&E) reported that one of its transmission lines off Camp Fire Road in Butte County had suffered an outage. Fifteen minutes later, a PG&E employee at the scene first spotted what would become the deadliest wildfire in California history. Investigators suspect that a downed high-voltage power line and damaged equipment started the fire. Spurred on by whipping wind gusts, the fire quickly overtook the parched brush in the surrounding foothills of the Sierra Nevada, spreading the blaze to the town of Paradise, California, population 27,000, and into nearby communities at the rate of a football field per second. Before the blaze was contained 17 days later, 85 people had been killed, more than 150,000 acres had been burned and close to 19,000 buildings were destroyed. The total cost of the fire damage was estimated at $16.5 billion. Shortly after the fires were contained, a number of agencies joined to begin what they called an “unprecedented wildfire cleanup effort” that will span approximately 14,700 properties and cost an estimated $3 billion. The California Department of Resources Recycling and Recovery (CalRecycle); Butte, Los Angeles and Ventura Counties; the California Department of Toxic Substances Control (DTSC); the U.S. Environmental Protection Agency (EPA); the Federal Emergency Management Agency (FEMA); and other federal, state and local partners will work together under the leadership of the California Governor’s Office of Emergency Services (CalOES) to carry out the state-managed debris removal. 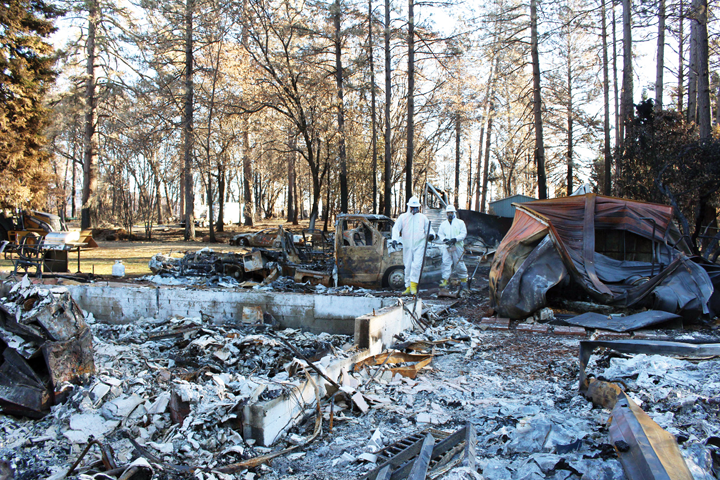 The agencies divided the cleanup effort into two phases: removal of household hazardous waste and removal of other fire-related debris. The first phase of the cleanup, which began Dec. 3 and is estimated to last a total of four to six months, involves crews managed by DTSC and the EPA. These crews are specifically focused on sorting through on-site rubble and ash to remove remnants of household hazardous waste, including paints, cleaners, solvents, oils, batteries, pesticides, compressed cylinders and tanks and easily identifiable asbestos. According to CalOES Director Mark Ghilarducci, expediency is paramount in the initial stages of the cleanup in helping facilitate an orderly and efficient process. Once household hazardous waste is removed from a property, the second phase of the cleanup begins. Cleanup crews started the second phase—which involves site assessment and documentation, debris removal, erosion control measures and final inspection—Jan. 7. CalRecycle oversaw the appointment of general contractors and managing operations during this process. The agency selected ECC Constructors LLC, Burlingame, California; SPSG Partners JV, a joint venture including Dublin, California-based DeSilva Gates Construction and Pacific States Environmental; and Sarasota, Florida-based Ceres Environmental Services Inc., doing business as Environmental & Demolition Services Group, as the primary contractors for the cleanup after a bid process that culminated Jan. 22. ECC Constructors LLC and SPSG Partners JV will work within the city limits of the town of Paradise. Each agreement is for approximately 6,350 parcels and an estimated cost of $750 million each. Environmental & Demolition Services Group’s agreement to perform work outside the town of Paradise is for approximately 2,000 parcels and an estimated cost of $200 million. According to CalRecycle Public Information Officer Lance Klug, each primary contractor will employ a number of subcontractors to help facilitate the cleanup. Before crews begin removing debris during the second phase of the cleanup, they first measure and record the foundation, structures, debris, utility infrastructure and property-specific hazards on site. Photographs are taken at each site and compiled with written records. These records get checked and verified by a representative from CalRecycle, CalOES or an affiliated worker from the incident management team. Crews then obtain and evaluate soil samples to establish cleanup goals for the project while identifying and removing any asbestos-containing materials that might remain. CalRecycle uses independent, California-certified labs for its testing and analysis. 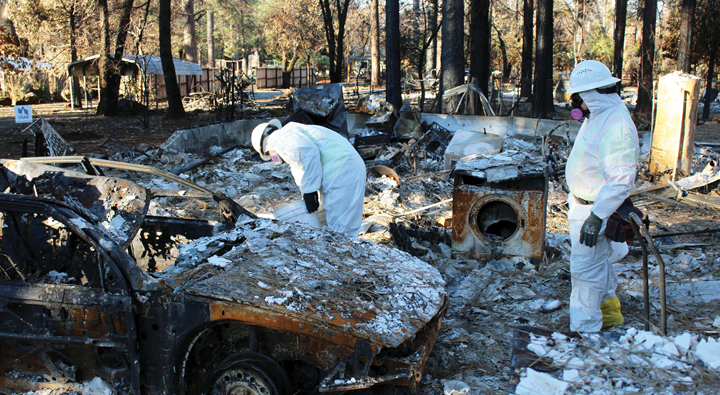 After initial site assessment and documentation, crews turn their attention to the debris removal process, where they’ll collect and remove all burnt debris, foundations, dangerous trees and contaminated soil. Klug says that while at least 3 to 6 inches of soil may be removed in a typical plot’s clearing, crews do everything possible to ensure that they aren’t over-striping the land. Daily monitoring of tonnage reports and grid testing helps the agency maintain appropriate volumes during the cleanup, Klug says. The agency also focuses on other erosion control measures to control sediment runoff and promote future vegetation growth. For larger debris, Klug says special oversight is being conducted to ensure cleanup operations go according to plan. Klug notes that every parcel of debris is appropriately categorized before it leaves the site for more comprehensive documentation. Klug says that the nature of the material being handled at the Camp Fire cleanup puts an added emphasis on safety. The agency conducts daily oversight to help make sure operations are safe and compliant with industry standards. Klug says that working with those in the community is part and parcel of the cleanup effort. He notes that CalRecycle’s presence is a fixture at community meetings as the agency aims to listen to—and address—the needs and concerns of area residents. Participation in the debris removal program requires homeowners interested in CalRecycle’s services to return a right of entry form before work begins. Klug says that crews go out of their way to help accommodate any requests residents might have during the cleanup. One of the overarching goals of CalRecycle’s community engagement strategy is to limit disruption as much as possible. That’s why the agency works to maintain a minimal footprint during operations. Klug says that although every project is different, CalRecycle has leveraged its years of debris removal experience to help streamline the Camp Fire cleanup. “CalRecycle has managed more than 20 debris removal operations since 2007, and, of course, we learn new things and improve our oversight processes along the way,” he says. “And because of this, these communities know and respect our work and respect the process because they know we respect them and their community. So that’s why our oversight processes are meticulous, and that results in fewer problems and complaints along the way. Managing a $3 billion cleanup project requires careful planning and execution, but according to Klug, helping make the community whole again is CalRecycle’s biggest responsibility. This article ran in the January/February issue of Waste Today. The author is the editor of Waste Today and can be contacted at aredling@gie.net. Waste Industries of Raleigh, North Carolina, has acquired Coastal Ladies Carting Inc., also known as Pink-Trash, a trash and recycling pickup service based in Wilmington, North Carolina. WilmingtonBiz reports that the deal took effect March 1. The news outlet reports that Waste Industries said it will honor Pink-Trash rates for residential and commercial customers for both trash and recycling services. Pink-Trash launched in 2011 and grew to be known throughout the community for its pink trash cans and refuse trucks. The company donated 1 percent of its residential and commercial customers’ bills toward cancer treatment. According to WilmingtonBiz, Kelly Buffalino, the owner and president of Pink-Trash, said that additional details about the company changeover could be released in the coming days. Waste Industries’ general manager in Wilmington, Shawn Haines, told the news outlet that the pink carts wouldn’t change. Pink-Trash had 76 employees who were all “welcomed by” Waste Industries if they chose to be, Buffalino told WilmingtonBiz. Waste Industries is a subsidiary of GFL Environmental, based in Toronto, Canada. GFL acquired Waste Industries last October to create an environmental services company with operations in all Canadian provinces (except Prince Edward Island) and in 20 states in the U.S. Waste Industries at the time was deemed to have an estimated enterprise value of $2.8 billion. Organization’s CEO seeks detailed definitions and clarity on how standard will be applied. The president and CEO of the Arlington, Virginia-based National Waste & Recycling Association (NWRA) has written a letter to the creators of the SWEEP standards seeking clarification on parts of the proposed SWEEP Municipal Standard. NWRA President and CEO Darrell K. Smith opens his letter to SWEEP objecting to its decision not to accept comments from trade associations during the three-week period that SWEEP is seeking comments on the latest version of the Municipal Standard. Smith’s letter expresses uncertainty about “who the standard applies to” as one objection. He adds that “what materials are included in this standard is lacking clarity,” asking the SWEEP standards group in particular for clarification on biosolids. Another question raised by Smith is whether some municipal waste and recycling programs can meet the standard from the outset, or measured improvements be required by all cities and waste districts that apply. Additionally, Smith expresses uncertainty about how or whether small cities and districts will be scored differently compared to large ones. Regarding the material recovery facility (MRF) recycling portion of the standard, Smith seeks further clarification on how contamination or residue rates will be measured at facilities. He also asks whether incinerator diversion will be weighted equally with landfill diversion. His final set of questions relates to how or if SWEEP will incorporate ANSI standards versus developing its own standards. Ministry of Environment announces all imports of plastic scrap will be prohibited. In a step toward "fighting against plastic waste," the government of India has completely banned plastic scrap imports. The ban affects U.S. exports of more than 12,000 metric tons of material worth more than $46 million, according to the Washington-based Institute of Scrap Recycling Industries (ISRI). India’s Ministry of Environment, Forests & Climate Change (MOEFCC) announced the ban on Twitter on March 6. According to the Twitter feed, the Management and Trans-boundary Movement, amended March 1, prohibits materials from entering Special Economic Zones (SEZs) and Export Oriented Units (EOUs), where they previously had been permitted. After China’s import ban, India has emerged as one of the largest importers of plastic scrap; however; the country doesn’t have the infrastructure or capacity to process all of the tons of plastic scrap entering the country, officials say. The amendment also aims to boost the “Make in India” initiative by exempting silk waste exporters from “requiring permission from the ministry.” In addition, “electrical and electronic assemblies and components manufactured in and exported from India don’t require permission from the ministry for import” if found defective. A Twitter user commented on the post, asking, “What will be the fate of the existing plastic recycling companies located in SEZ and EOU” zones? The timeline of when the new policy will be implemented is unknown.